The Blue Pencil is Back in its Box! Finally! I sent the copy edits of CALLING MR. LONELY HEARTS back to Ballantine today. I feel like celebrating! Alas, it may not be the last time I see CMLH in manuscript form if I wasn’t clear enough on corrections. Then come the bound galleys, aka ARCS. As soon as I get my hands on some, I will be sure to share one. I’m pondering some clever competition….Hmmmmm. But there’s no rest for the wicked (though I will get off of the computer here soon–last night was a late one with the blue pencil). The fun begins again next week with a photo shoot with uber-wonderful photographer Jay Fram. I have to get my latest haircut on the CMLH jacket! Actually it’s not totally a matter of vanity. Those pesky photos need to be updated every two years. But what to wear?! Speaking of book jackets–I received two today. 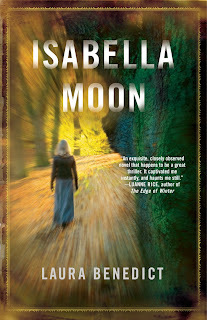 One, a near-final version of CALLING MR. LONELY HEARTS, and the other the paperback version of ISABELLA MOON. I’m particularly excited about having IM in trade paperback. I know how expensive hardcovers are, and having a paperback will make IM available for many more readers. Now THAT makes me happy! Tomorrow: Julie Kramer, fellow thriller-writer chick (STALKING SUSAN), pops into The Handbasket. I hope they’re not going to change the cover too much from the one you’ve got posted, I love that cover. And I can’t wait for the book to come out. Now wait a minute,if I start getting into an authors style of writing,I never buy paper back. A hard back book laying around the house will always retain some clasieness,although they do take twice the space. I am reading slow these days,however when I finish my latest WEB Griffin book,the next one shall be your “IM”. Thanks, Danielle. I love it, too and they would have to step over my bleeding body to change it! That’s very exciting! I can’t wait to read the book! As for pictures, you’ll look fantastic in whatever you wear.